First of all, we have some super, super exciting news. After nearly a year of planning, planning, testing, cooking, writing, photographing, agonizing, organizing, not sleeping, and stressing, we are officially done with the manuscript for our second book! There’s lots and lots of work ahead for us, but this is such a huge, monumental milestone and we’re so grateful to all of you who have stuck with us, been patient through weeks of sweet treats (because we were busy writing actual dinner recipes for the book), and have given us hope that someone will buy the next book. We love you guys and can’t ever thank you enough for being the best blog readers ever. In the last year or so, I’ve kind of been having a love affair with quinoa. It’s so versatile and delicious and healthy. It’s quicker-cooking than brown rice, but you can use it in so many of the same ways that we’ve started using it quite a bit instead of rice. One of my favorite ways to eat quinoa is in salads (like this one or this one). I love this particular salad because it has pomegranate arils, which I love, but I can only eat in small quantities because the juice hurts my teeth (yes, I’m 90 years old) and smooth, creamy bites of avocado. You’ll need cooked quinoa, seeds from 1 pomegranate, about 1/2 of a red onion, 1/2 of a cucumber, 1-2 avocados, a can of drained and rinsed garbanzo or great northern beans, about 1/4 cup chopped cilantro or parsley, and kosher salt and freshly ground black pepper. For the dressing, you’ll need juice from an orange, lemon, and lime, a clove of garlic, a little bit of pure olive oil (extra-virgin is a little too strong here, at least for my taste), a bit of sugar or other sweetener, and a little more kosher salt. and toss with your hands until combined. Add the chilled quinoa and toss to combine. To make the dressing, whisk together some freshly squeezed orange juice, lemon juice, lime juice, 2-3 teaspoons of sugar (or honey, agave, or Splenda if you prefer), 2 tablespoons oil, and about 1/2 heaping teaspoon of kosher salt. Drizzle it over the salad and chill until ready to serve. When you’re ready to serve, add 1-2 diced avocados (depending on the size of and love for avocados) and serve. This can either be a light meal or served as a side dish. Combine diced cucumber, minced onion, chopped cilantro, pomegranate seeds, and drained and rinsed beans in a large salad bowl. Toss with quinoa. Drizzle the dressing over the mixture and toss to combine, then chill until ready to serve. Before serving, add diced avocado and eat immediately. Makes 6-8 main dish servings and 10-12 side dish servings. I wonder if this would work with mango added instead of avocado? It would be great! You could also use both. I love your first cook book and I cant wait for the second. Thanks for all your hard work. Congrates. I totally learned something today. I’d never heard of quinoa until I saw this post. It looks like an awesome recipe, especially because it has pomegranate arils (didn’t know that word either) as well as cilantro in it. Thanks again! This looks abundantly delicious, pretty, and healthy! I love your recipe theme this month. Congratulations on completing your 2nd manuscript. I cannot wait to see the new book! Happy Friday! Ahh, I was wondering the same thing – it IS pretty, I’ll have to keep an eye out for it! So excited for the new book! Is it going to be formatted the same as your other book? I love all the pictures and the spiral binding so it lays flat! I’ve never tried quinoa (not opposed just never come across it when I’m shopping) but this salad is going to push me over the brink! Looks delish! Thanks! I literally just opened up my pantry, saw my bag of quinoa, and thought to myself that I needed some more recipes. Perfect timing. So I’m a nerd and just bought your first book off of Amazon. It’s crazy, it 5 star fabulous. I needed new recipes apart from the old Mexican standbys I grew up with. Time to mix it up! Thanks for your wonderful blog and congrats on the new book! Oh my! 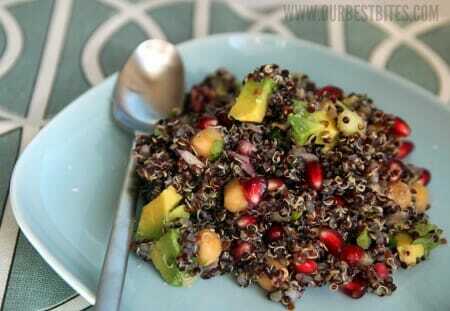 That dark Quinoa is absolutely beautiful! I love the light stuff: my pantry is stocked with it, but man, I need to try the dark version! This looks incredible! Oh man, this looks delicious! I joined a biggest loser competition that starts next week. This looks like a great lunch option! I love quinoa salads and this looks like a good one to add to my overgrowing rotation. I usually make a large bowl and eat them for lunches during the week. Thanks for this recipe! Love the mango quinoa salad-can’t wait to try this one!! I have a huge bag of quinoa in my pantry waiting to be finished off! Just FYI-Costco has big bags of quinoa for an amazing price!! I love your first book and I got your calendar for christmas, and I am totally loving it! I cant wait for the second book! Congrats! Not that I’m counting or anything, but cilantro this week is 3 for 3. You know how much I love that stuff and that’s why you keep putting it in all your recipes, right? I love that you love quinoa! Keep the recipes coming. Can’t wait for book number 2. Thanks for another quinoa salad recipe. 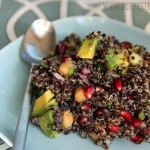 Your Mango Quinoa Salad made my “Best of 2011” recipe list this year. This one sounds just as wonderful. I have never tried quinoa. If it’s like rice, can you make it in a rice cooker? Yes. It turns out perfect in my rice cooker. Thanks for all your time and hard work in making a second cookbook so the rest of us mom’s can make delicious food for our families. I have never tried a cookbook that I like as much as yours and also that I can really make any recipe in the whole book and not be dissappointed! So when DOES the new cookbook come out?!??? I can not WAIT! Why is the quinoa black? Mine is whitish….. WOW!!! I made this for dinner tonight and my husband requested it for his birthday in March! I just hope I can still get the pomegranate 🙂 Thank you!!! I saw this post this morning and have been thinking about it all day! I have got to try it! Especially since it’s dairy free without me having to adjust the recipe. (Dairy protein allergies really stink sometimes.) Thanks! This looks delicious. I can’t wait to try it. We love quinoa at our house. It also makes a great bread and I love it in cookies with craisins and dark chocolate -yum. Can’t wait for your next book! Silly question: can you eat pomegranite seeds? I’ve only tried one once and was at a loss as to how to eat it. Any help? Thanks! 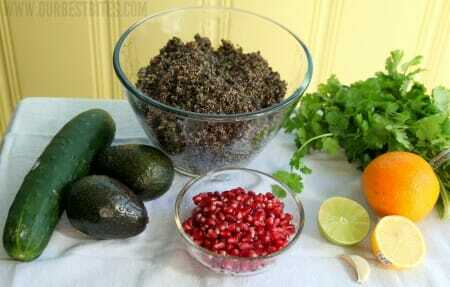 I love quinoa and this salad looks so yummy thanks for sharing this recipe! I love your blog! I was skeptical about the pomegranate/cucumber/quinoa combination, but all your quinoa salads are main staples at our house now so I thought I’d give it a try. Can I just say AMAZING!! My whole family enjoyed this salad, even my 2 year old. Thanks for another delicious quinoa recipe. So is the broth used for cooking the quinoa? This has all my favorite ingredients in it. Yipee! Great news on Book 2! I will definitely be purchasing that. I love your blog, and sooooo appreciate you sharing your great recipes with us. Reading your fun, colorful blog makes me happy!!! I happened to have some bulgar on hand so I decided to substitute. Delicious! Will be having this for lunch all week!! Thank you for this! My friends and I have been trying to find more recipes with quinoa, and I know that since it is from you it will be good! Oh and my hubbie got me your cookbook for Christmas…been eating your recipes every night and we love it. I will buy your second one! 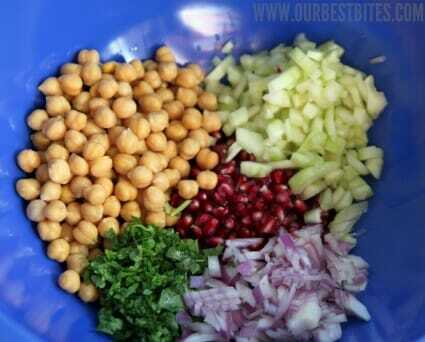 This salad looks so yummy. I love pomegranates…I’m excited to use it in another recipe. I wanted to ask what part of Louisiana do you live? My family and I lived in Metairie for 9 years. I miss it everyday, and all quirks of the south. Oh no, I’m getting behind! I’m still trying to figure out a way to get a hold of your first book, and you’re coming out with another? Hey, Wendy! 🙂 Ordering it on Amazon is probably the easiest way to go! Oh, I WISH! 🙂 Unfortunately, both the recipe and pictures of Tim Riggins are copyrighted, hahaha! I love quinoa and am always looking for fun, tasty new recipes. I made this as soon as I could but did some substitutions. Zucchini instead of cukes, craisins instead of pomegranate and black beans instead of chick peas. It was wonderful!! I thought I loved you guys before, but I think I’ve gone stalker status with this recipe. Absolutely delicious!! Thanks for sharing! I have made this salad three times now and took a double batch into work today. You may have a few more followers – they loved it! Only problem I’m having now is pomegranates are getting hard to come by – I will be searching high and low tomorrow afternoon for them. Your tutorial on pomegranate arils mentioned that they sometimes take the place of dried cranberries. 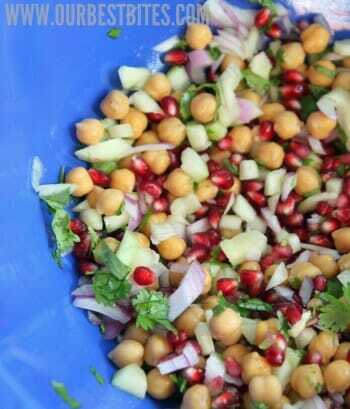 Have you tried this salad with them before? And if not, do you think it would taste good with dried cranberries? Just made this with black beans instead of chickpeas and your lime cilantro dressing…. delish. Love it! Our stinking backwoods of Maine grocery store didn’t have pomegranates! I’ll be trying this with craisins instead. Not the same, I know. But hopefully still delicious. Thanks for another great recipe! You rock my kitchen. You can buy pomegranateswhen they are abundant, seed them and freeze the seeds for use later. It works just fine. We have a middle eastern store in Houston (Phonecia) that sells black, red and reqular Quinoa. I love the red! The texture is very different from any other grain. It is rather expensive though. This is DELICIOUS. Thank you! Finally made this today as a side to your crispy coconut chicken strips from your cookbook … what a great meal. This is probably my favorite of your quinoa salads, love the citrus dressing 🙂 Just wish I would have made it sooner so I could get the pomegranate … couldn’t find one anywhere so I just did the craisin substitution that was mentioned in the comments, still great. Many thanks to the both of you for creating these amazing meals!! I always know the food will turn out great if it’s one of your recipes … and SOooo excited for your next cookbook!! Love, love this salad. Love quinoa. No pomegranates this time of year but I did have fresh rasberries (from Costco) added them instead. Delicious!!! Making this tonight for Thanksgiving. For 150 people. Yes, that is not a typo! I forgot to eat dinner, so after I had chopped and cooked the quinoa, I tossed a bowl of this delishisness without the beans and avocado (I have to travel 3 hours with this. I will put them in when I get there. Without two of my fave ingredients, this was AMAZING! I can’t wait to share it tomorrow. I don’t know if you have a pomegranate tutorial on your site somewhere already, but I just found this video that shows how to completely deseed a pomegranate in 10 seconds: http://lifehacker.com/5895852/deseed-a-pomegranate-in-10-seconds-using-a-wooden-spoon. Pretty cool! I think I already left a comment on this post about how much I like this salad, but I just made it again a few days ago and I really have to say that it has become one of my favorite dishes of all time. I would eat it for every meal! Actually, I do eat it for every meal! When I can’t get pomegranates in the summer I just add mangoes instead. And if I want to make it into a more filling dinner I use some rotisserie chicken. Most of my family likes it as well. Considering there are 8 of us, that’s a pretty great accomplishment! Thanks for all you do! Question: what is the water/chicken broth for? For cooking the quinoa? Thanks – looks delish!! Yes, for cooking the quinoa! I made this last night for a friend and myself. It is delicious. I did feel like it needed a little more zip so I added a splash of rice vinegar.